Yesterday was another cold one by south Florida standards. When I drove home the car thermometer was showing 55 degrees. It was also windy which made it less comfortable. We have had the heat on a few times during this cold spell. If the temperature in the house gets below 70 degrees both of us feel chilled to the bone. Of course I realize comparing this to the insane, life threatening cold some areas of the country are experiencing is silly. The forecast after today has highs back into the 70’s which is much more welcome. Danielle, the baby chicken that I am 99% sure is a rooster poked Elsa in the nose yesterday when she was sniffing around the chicken tractor. We are trying to ask around to people we know that have chickens to see if they would like to add a young rooster to their flock. Cindy and I don’t want to give the bird away to a situation where we aren’t confident that it will be well taken care of. That is not an easy situation to find as our standard of care for our chickens exceeds the norm. 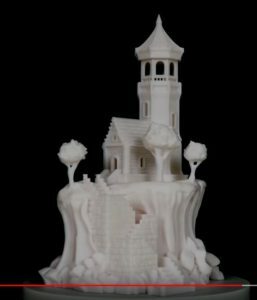 I’m in the middle of a cool print with my new CR-10 Pro, a lighthouse on an island. Once it is done I will be handing it off to Cindy to paint, it will be likely be one of her most detailed craft painting projects ever. So far every print I have done has been perfect. Unlike my last two printer purchases where I had some buyers remorse, the CR10 Pro has exceeded expectations. Without making a real conscious decision, we aren’t having a Super Bowl party this year. I have missed a few years here and there so I am fine making this a “bye year”. When you watch the game outside of a party environment it is a much different experience for sure.